The parts of the adolescent brain that develop first are those responsible for physical coordination, emotion and motivation. However, the part of the brain that controls reasoning and impulses — known as the prefrontal cortex — does not fully mature until the age of 25. So during the teen and young adult years, your child is especially susceptible to the negative effects of any drug use, including marijuana. Evidence has shown that marijuana use during the teen years could potentially lower a person’s IQ and interfere with other aspects of functioning and well-being. Even the occasional use of pot can cause teens to engage in risky behavior, find themselves in vulnerable situations and make bad choices while under the influence. Keep an open mind. When a child feels judged or condemned, they will be less receptive to the message. Try to project objectivity and openness. Put yourself in your kid’s shoes. How would you prefer to be addressed when speaking about a difficult topic? Try to remember how you felt as a teen. Be clear about your goals. Know what you want to get from the conversation. Be calm and relaxed. Approaching the conversation with anger or panic will make it harder to achieve your goals. Be positive. Approaching the situation with shame, anger or scare tactics will be counter-productive. Aim for curious, respectful and understanding. Don’t lecture. It will most likely lead to shutting down, tuning you out, anger or worse. Find a comfortable setting. Announcing a sit-down meeting will likely be met with resistance, while a more spontaneous, casual approach will lower anxiety (including your own). Be aware of body language. Finger-pointing and crossed arms are closed gestures, while uncrossed legs and a relaxed posture are more open. 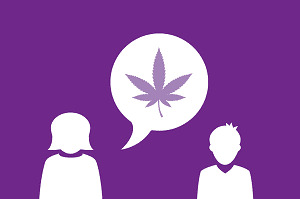 Unfortunately, there isn’t a script for talking about marijuana, but there are some common arguments and questions that you’re likely to hear — and suggestions for how to respond. The drug landscape will continue to change with the times, but the one thing that will remain constant is the need for support and information when raising a child. You’re the most important, and most powerful influence in your child’s life. We’re here to help you along the way.